A BMX rider in Cirque du Soleil's Volta rehearses in Oaks, PA, under the Big Top tent, Wednesday, July 11, 2018. 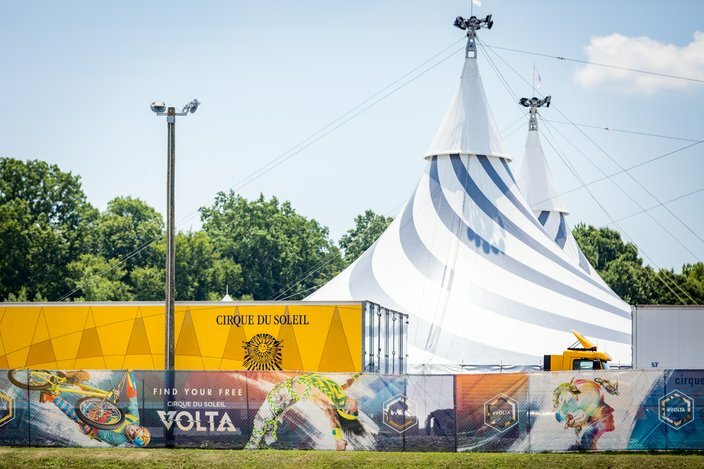 An almost mountain-like range of tents resembling massive Hershey’s Kisses have popped up adjacent to the Greater Philadelphia Expo Center in Oaks, PA.
That’s Cirque du Soleil’s Big Top tour of "Volta." Performers from around the world will bring the audience on a creative journey of transformation and freedom while incorporating so much of the high-flying acrobatic sequences you’d expect from a Cirque show. Volta also features creative acts of trampoline, shape diving, ladders, rope-skipping, contemporary dance and bungee routines. 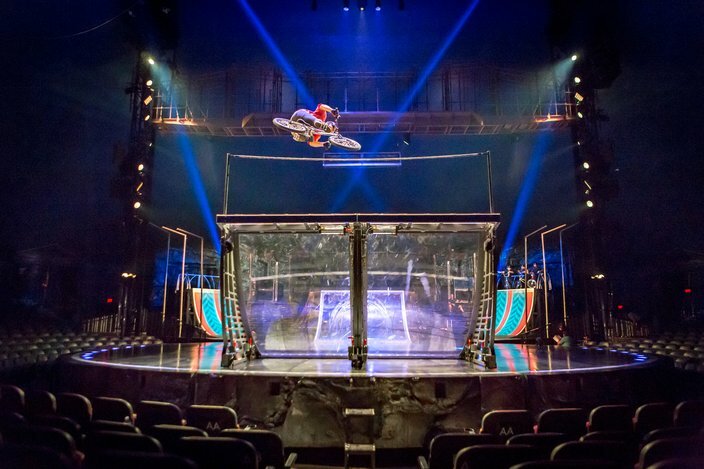 And for the first time – an impressive BMX routine sends performers launching into the air from massive plexiglass ramps positioned just feet from the audience. "[Volta] is about being true to oneself, fulfilling one’s true potential, and recognizing one’s own power to make it possible. Ultimate freedom comes with self-acceptance, and with the liberation of judgement of others," the show is described as in a press release. The show premieres today, July 12 and will run through Aug. 19. More information about the ticketing and the performance can be found here. The series of photos below are from one of the final rehearsals before the show opens in the Philadelphia-area. Visible just off of U.S. Route 422, a impressive, almost mountain-like range of tents resembling Hershey's Kisses cover a large footprint of land adjacent to the Greater Philadelphia Expo Center in Oaks, PA.
Elisa Murphy, right, and Sue Curcio, local wardrobe employees of IATSE 799, make repairs to a floral unitard that is worn by a female artist in the show. 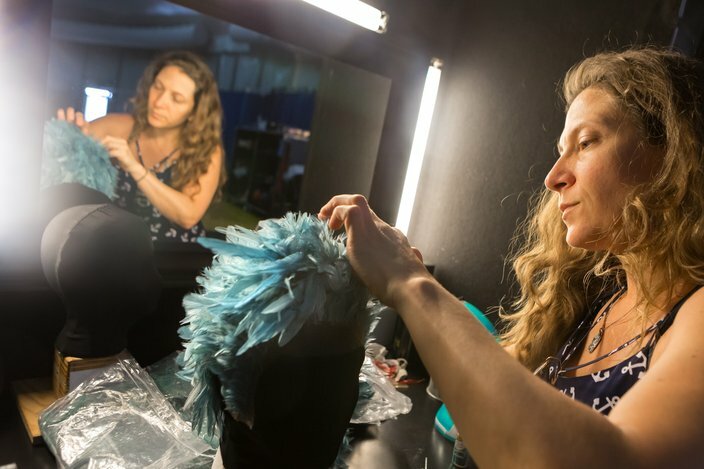 Amber May, a wardrobe fly-in that has worked on Cirque du Soleil shows for years, makes repairs to an artists wig in the backstage area of the venue. 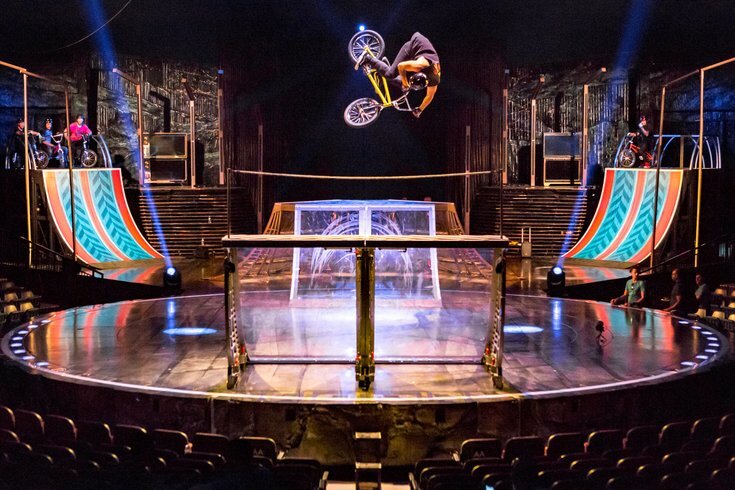 Volta is the first Cirque du Soleil show featuring a BMX routine. 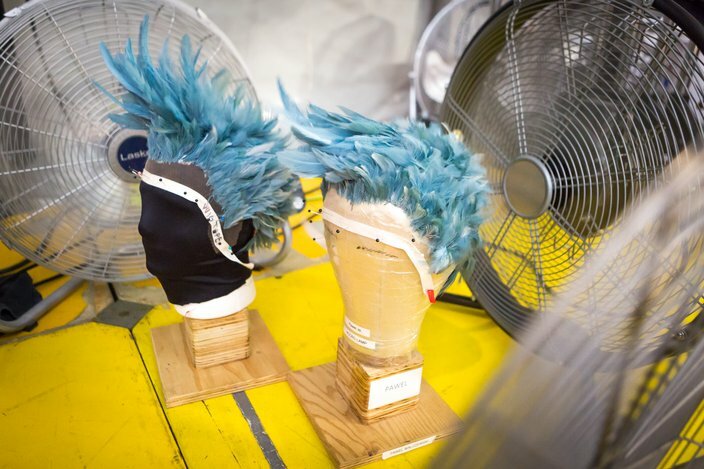 Feathered wigs set up between fans blow dry following repairs made backstage. 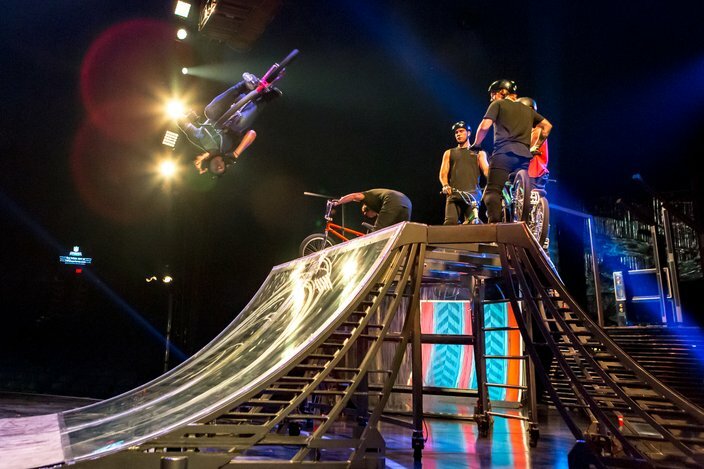 A choreographed BMX routine sends riders soaring high above the audience on a series of custom-made plexiglass quarter pipe ramps. Charlotte Sumian, an acrobat, aerialist and dancer warms up backstage of Cirque du Soleil's Volta, July 11, 2018. 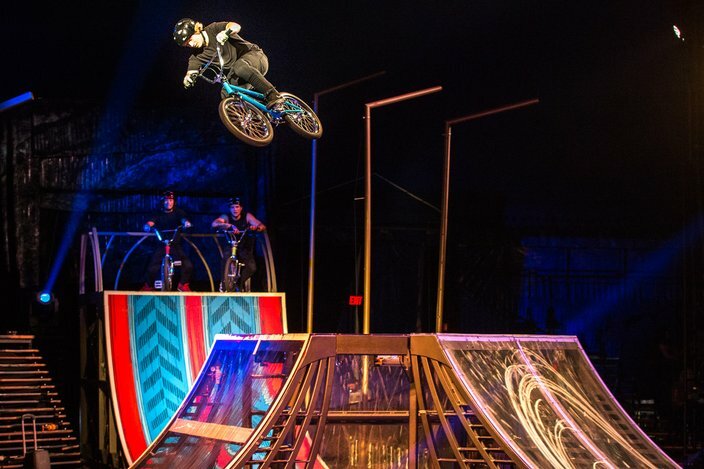 A BMX rider transfers between a series of ramps during a rehearsal routine under the Volta Big Top tent. 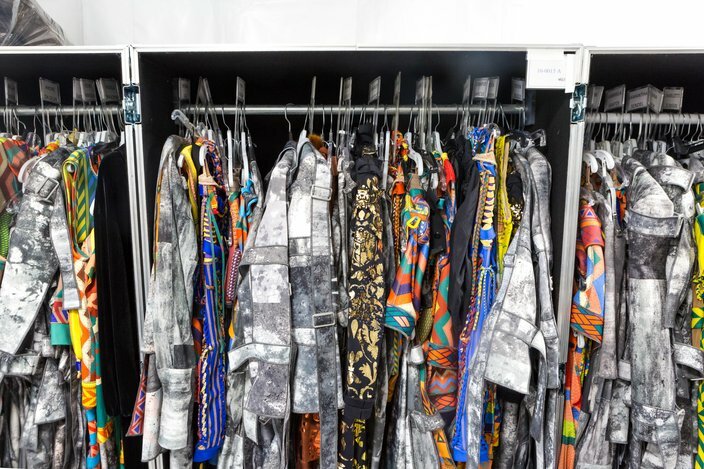 Road cases filled with costumes line the walkways to the wardrobe room at Cirque du Soleil's Volta. 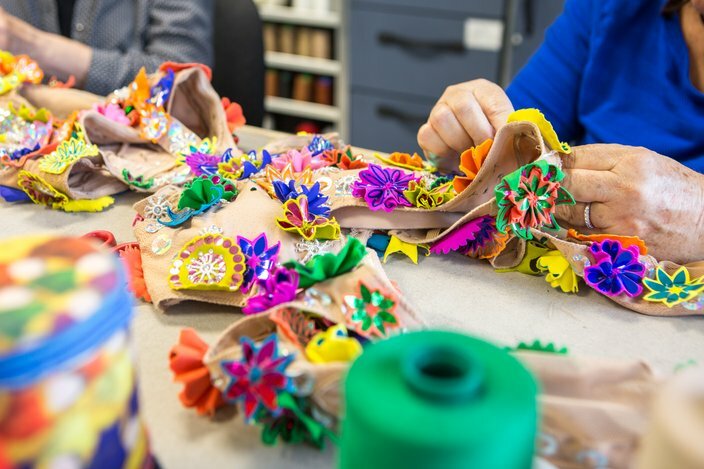 Many of the costumes use the technique of sublimation to dye fabrics in custom patterns.